Our Alo Yoga Review: Leggings And More! Alo Yoga is determined to deliver high quality, mindfully made, studio-to-street yoga wear to consumers who live as mindfully as they shop. The company, started in 2007, dresses and impresses yogis everywhere, including celebrities of the practice like Dalia Sutra, Ashley Galvin, and Dylan Werner. Yoga is an all-season sport, but a change in the season means all new colors, styles, and shapes at Alo Yoga. 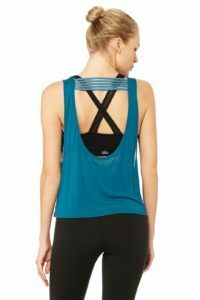 Our Alo Yoga review covers some of the brand's best leggings, pants, tops, and mats, along with some favorites for customers shopping from Australia. Perfect for the uncertain weather and cool breeze of autumn, the Sunset Jacket in White gives just the right amount of coverage over your favorite Alo Yoga sports bras. 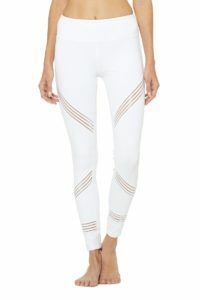 These Sage colored High-Waist Dash Leggings have filament trim detailing on the back for comfort and style. Flat-locked seaming, temperature-regulating fabric, and performance stretch make these leggings perfect for your practice. If you need help buying Alo Yoga items from the US, Big Apple Buddy can help. We can help you buy products from the US and ship them to you anywhere in the world. We offer international shipping to over 110 countries including Australia, Austria, Azerbaijan, Bahrain, Belgium, British Virgin Islands, Brunei, Bulgaria, Canada, Chile, Costa Rica, Croatia, Czech Republic, Denmark, Estonia, Fiji, Finland, France, French Polynesia, Germany, Gibraltar, Greece, Greenland, Hong Kong, Hungary, Iceland, Indonesia, Ireland, Israel, Italy, Japan, Jordan, Kuwait, Latvia, Liechtenstein, Lithuania, Luxembourg, Macau, Malaysia, Maldives, Malta, Marshall Islands, Mauritius, Monaco, the Netherlands, Netherland Antilles, New Zealand, Norway, Oman, Poland, Qatar, Romania, San Marino, Saudi Arabia, Serbia and Montenegro, Seychelles, Singapore, Slovak Republic, Slovenia, Spain, South Africa, St. Lucia, Sweden, Switzerland, Taiwan, Thailand, the UAE, the UK, Vatican City, and Vietnam. If you would like to buy from the USA Alo Yoga online store, simply get in touch and let us know which items you would like to order. We’ll get back to you with a free international shipping quote within 24 hours!